Los Angeles is a crowded city, which makes finding the space to build your dream home pretty tricky. Sitting on the steep, steep hillside of the Crestwood Hills neighbourhood, the 3,700 sq. ft. Jovanovic residence renovated an existing structure by applying a series of progressive and sustainable building strategies. Lorcan O’Herlihy Architects found a solution to the problem of free space by building Implant Dentist Sascha Jovanovic’s family home directly onto the slopes of the LA hills. As reported by Arch Daily, the team incorporated lots (and lots) of foil wrap and various program elements such as a new guest suite, significant modifications to the master bedroom, exterior decking, and an exterior sun screen. The architectural team behind this modern abode have achieved a cohesive structure that doesn’t look out-of-place on the hillside. The durable outer ‘skin’ is separated from the original stucco finish to serve as a shade that protects the house from the hot Californian sun and prevents it from getting too hot – which means the AC can take a chill pill. The white outer panels also act as an effective privacy device (although it would take a very determined individual to scale the Brentwood slopes to spy on this mega home!). Check out the gallery to see Jovanovic residence in all its glory! I have mixed feelings about this house, which was also featured in the LA Times. 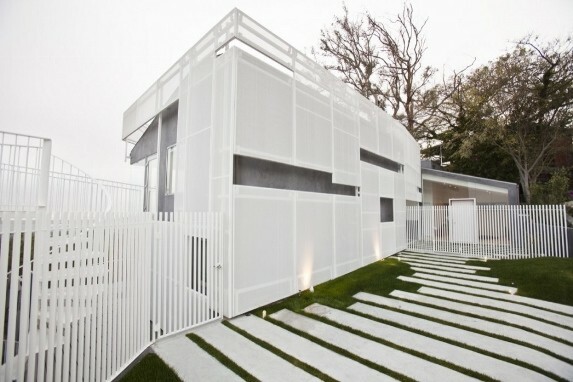 Also, it's incorrect to say "found a solution to the problem of free space by building Implant Dentist Sascha Jovanovic’s family home directly onto the slopes of the LA hills" as the house already existed and the perforated facade was created to give it a more modern look. The result, show in some the LA times photos, is that some of the views from behind that facade show its support struts etc., rather like being behind a billboard.